DNA gyrase is a highly conserved topoisomerase composed of two subunits, GyrA and GyrB, and is critical for bacterial DNA replication. 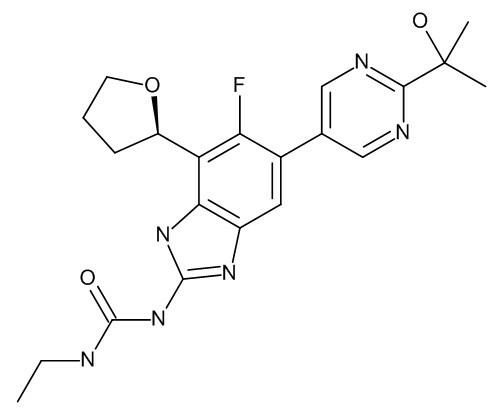 Quinolones target the GyrA subunit and GyrB inhibitors, some with anti-mycobacteria activity, have been reported, but none have yet reached the market. Data show efficacy for two GyrB inhibitors, SPR720 (formerly pVXc-486) and SPR750, in a murine chronic Mtb infection model. Treatment with SPR720 at 100 mg/kg administered twice daily was effective in this chronic infection model with a 2.5-log CFU decrease compared with early controls. This CFU decrease was similar to that of moxifloxacin and isoniazid in this study. SPR750 exhibited more modest activity with a 1.0-log decrease of CFUs. PK analyses showed good dose-proportional exposures after oral administration. Conclusions: Treatment with GyrB inhibitors, SPR720 and SPR750, showed efficacy in a murine chronic Mtb infection model. These data suggest that future studies are warranted to determine if they could replace quinolones in MDR/XDR drug therapy regimens.